This is GoodBed's look at three Serta iComfort pillows with memory foam and cooling properties. Note: This is not a review. 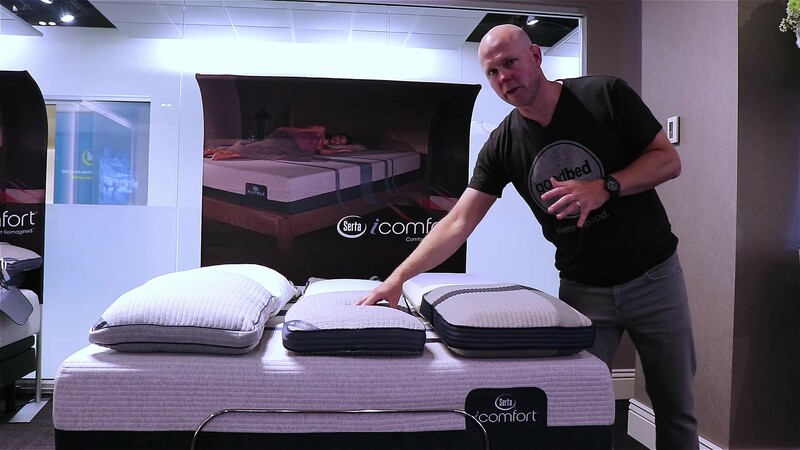 This is our plain-English explanation and overview of the three Serta iComfort TempActivePillows, made with memory foam and with cooling features. If you’d prefer to watch rather than read, check out our Serta iComfort TempActiv Pillows video. Below, from left to right are the TempActiv Scrunch, the TempActiv, and the TempActiv Max in Serta's iComfort pillow line. Included in Serta's iComfort line of bedding are three pillows in the TempActiv series. All three include memory foam. Each has a removable, washable cover, and all have cooling properties (though differ in what those features are), but that's about where the similarities end. Here's a look at how the three pillows compare when back sleeping. The Scrunch pillow is just like it sounds. Made of shredded memory foam, you can squish and rearrange the pillow as you like. It reminded us of a down pillow in that way. The ability to squish the pillow allows you to configure it however you like, as a thinner or a thicker pillow. For that reason, we think it could work for a variety of sleeping positions. The shredded memory foam includes gel, which is intended to help draw heat from the body and keep the pillow cool. Like all the TempActiv pillows, it has a removable and washable cover. The more expensive TempActiv pillow from Serta is made of a solid, molded piece of memory foam, in contrast to the Scrunch model that's filled with shredded foam. It's a flat pillow with very little doming (where the pillow poofs out). 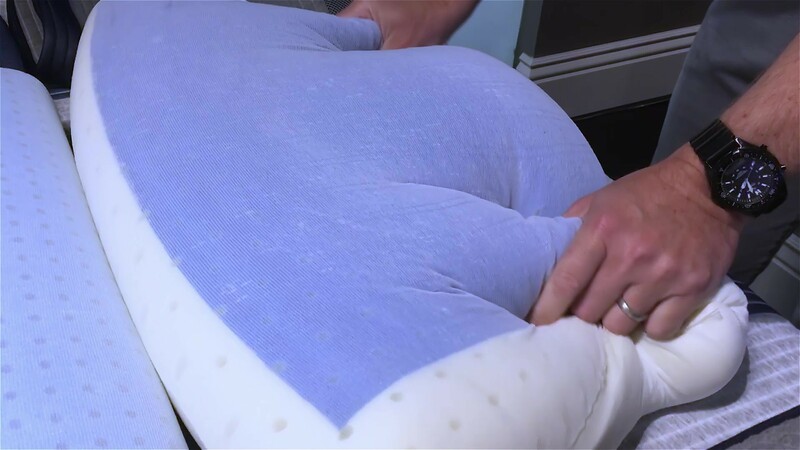 For cooling, this pillow includes a sprayed on phase-change material on one side of the pillow that's supposed to make it feel cool to the touch. The TempActiv also has a removable and washable cover. We thought the iComfort TempActiv pillow might be a good fit for back sleepers, since it is fairly thin. 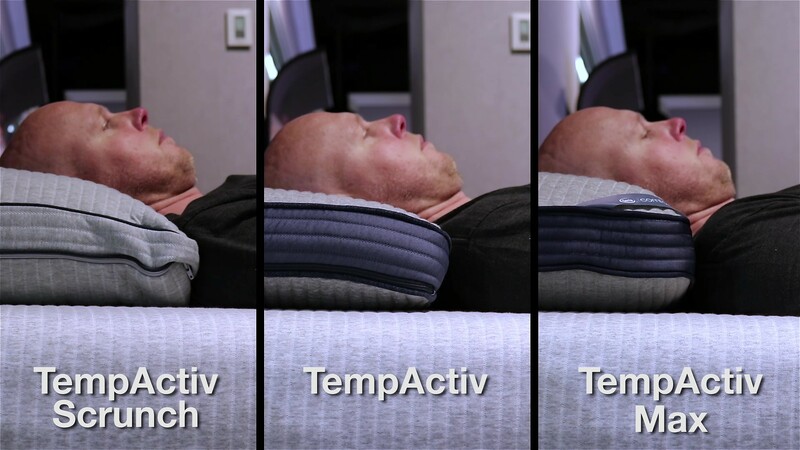 The TempActiv Max is the most expensive of the three pillows. It's a taller pillow than the TempActiv, but also made from a solid block of memory foam. On one side, the Max has a very thick layer of phase-change material intended to make the pillow feel cool on one side; to us, it almost felt laminated (you can see the blue phase-change material below). The TempActiv Max also has phase-change material in the cover, along with a vented mesh section on the cover intended to improve air flow. The cover zips off and is machine washable. Generally, we thought the Max pillow might work well for side sleepers, who typically need a taller pillow to create good spinal alignment. Serta pillows are available in many stores, whose delivery and return policies will vary. For orders placed online directly through the Serta website, delivery is free. Serta pillows carry a 5 year warranty against manufacturing defects. Is this Serta mattress right for you?